Every business transaction involves documents. From the request of the customer to the seller for certain goods or services to the delivery of goods or rendering of services to the customers, all of these require documentation for tracking as well as for accounting and auditing purposes. Just like when the seller demands for the payment of goods or services, a business invoice is issued. 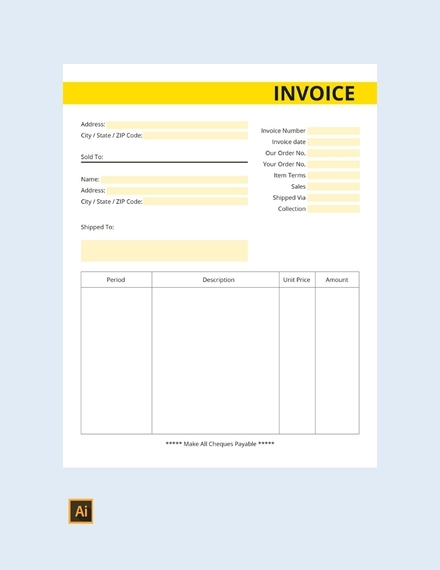 A business invoice is sent to the customer requesting or reminding the customer for a payment due. This is also important on the part of the customer in order to confirm and certify his or her order. Hence, it is important for both parties, the buyer and the seller, as both of them can benefit from the said document. What comprises your business invoice? What are the necessary information that must be present in your invoice? Below are some guides on what to include in your business invoice—the essential elements. 1. Seller’s information: In all your marketing material, your company name or your logo design must be present. Include as well your business address, phone or mobile number, email, and website. 2. Buyer’s information: You must likewise include the contact details on your business invoice such as the name of the client or the client’s contact person who handles your account, address, and phone or mobile number. This is important not just for making communication easier but also for legal purposes in case there will be issues regarding the receiving of the payment. 3. Itemized list of goods and services and their amount: People would like to know what they are paying for. So, commonly, they would like to have an itemized list of the goods and services that they would pay. Also include a detailed but brief description of the goods or services provided, the number of products purchased, and their corresponding amount. Do not also forget to include taxes and other charges as well. 4. Method of payment: Include and be clear on the method of payment for your transaction. Specify whether they can pay by check or you will only accept cash. 5. Terms and conditions: You specify the payment due date as well as the charges or fine for late payments. Your invoice will help you send follow-ups or notices of overdue payments to the client and inform the client regarding the interests. It will also remind them of when they need to process the payment. 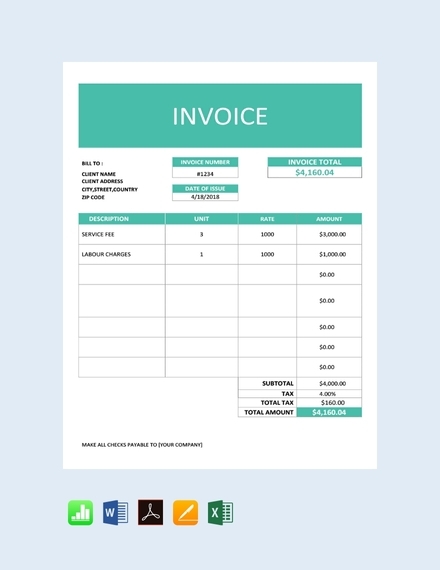 You may also see billing invoice examples. 6. Reference number: Every invoice must have a reference number that is distinct and unique from all the other invoice number for an easy recording and tracking of the transaction. 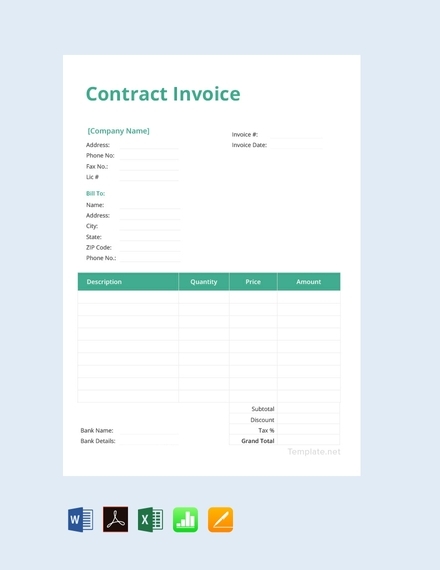 In recording the invoice, instead of writing the description, you can easily write the invoice number. It would also be easier for both parties to track the transaction just like when they are referring to the invoice, they can simply mention the invoice instead of describing the invoice and the payment. 7. Notes section: It also better to have a notes section or a message box in your invoice in case you need to include important account information, promotion details, or a simple thank you for patronizing your company. Business entities must know how to create a business invoice as this is among its important papers in a sales transaction. 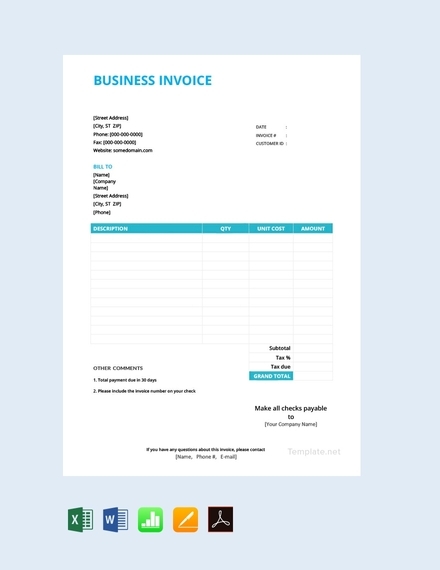 Not sure how to start creating a business invoice? Here are some guides that might be helpful for you. MS Word is a program that is very convenient and user-friendly, hence commonly used by a lot of people. 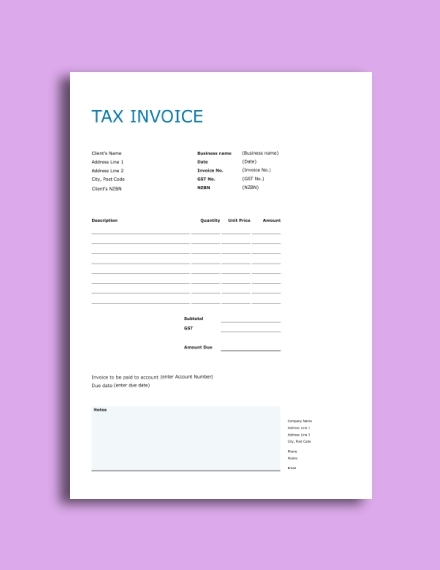 You can utilize this simple tool in creating a business invoice that would satisfy you. 3. From the drop-down menu, select templates. 4. You will then be presented different options for the format and style of invoice. Choose the one that you prefer for your invoice. 5. After choosing the format, edit the template and add the important information. 6. On your header, write your information—your business name, logo, business address, contact number, and email. 7. Below the header, write the customer information such as the contact person, address, and contact number. 8. Do not forget to include the date and the invoice number. 9. List down the goods or services availed of by the customer and their corresponding details and amount. 10. Specify the method of payment and the terms and conditions. 11. Then, ensure that the grand total or the final amount to be paid by the customer will be highlighted or rendered in bold for emphasis. 12. Lastly, recheck the information you entered and save the document. You can easily create a business invoice using Google Docs following these simple steps and tips. 1. Log in on your Google Drive account. 2. Create new document in the “New” tab. 3. 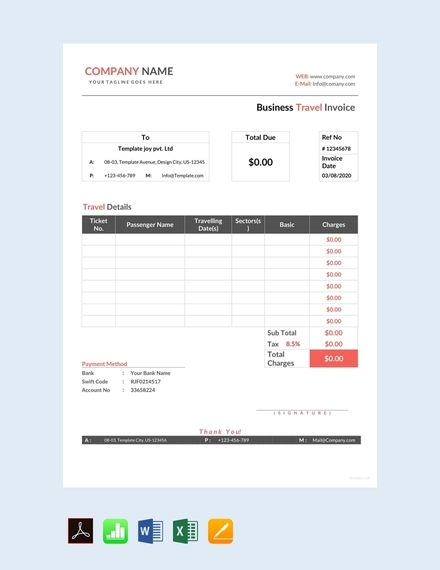 Choose from the available invoice templates, and select a design that you want for your business invoice. 4. 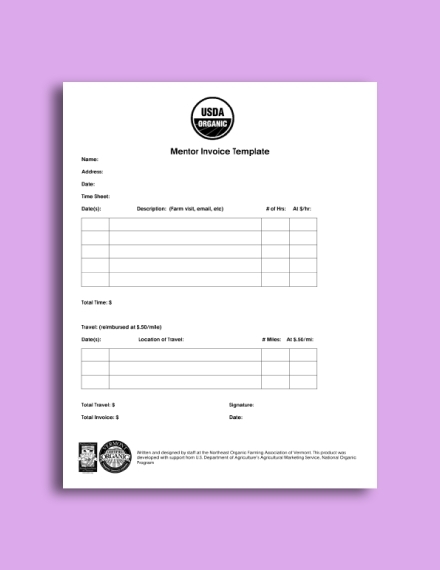 After choosing the format, edit the template and add the important information. 5. On your header, write the seller’s information such as the business name, logo, business address, contact number, and email. 6. Below the seller’s information, write the customer information including the contact person, address, and contact number. 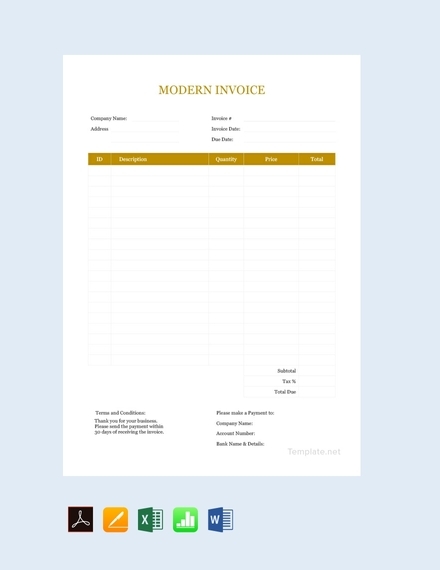 You may also see tax invoice examples. 7. Also include the date of issuance of the invoice and the unique invoice number. 8. Write an itemized list of the goods or services availed of by the customer as well as their corresponding details and amount. 9. Specify the method of payment and the terms and conditions. 10. Make sure that the grand total or the amount due can easily be seen by rendering it in bold or making the font size bigger than the rest of the text. 11. Recheck the information you entered, and save your document. Using MS Excel, you can easily create a business invoice of your own preference. Here is how you do it. 2. From the drop-down menu, choose the Invoice icon. 3. 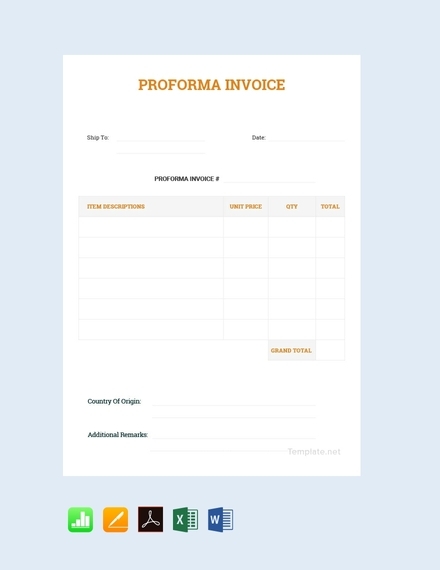 Select the format for your business invoice. 4. On top of your invoice, write the information of the seller such as the business name, logo, business address, contact number, and email. 5. After, write the customer information which includes the contact person or the client, address, and contact number. 6. Also include the issuance date and invoice number. 7. Create a list of the goods or services provided to the customer along with their corresponding details and amount. 8. Do not forget to specify the method of payment and the terms and conditions of the transaction. 9. Sum up the amount and write the grand total below. 10. Finally, save your work before you exit. 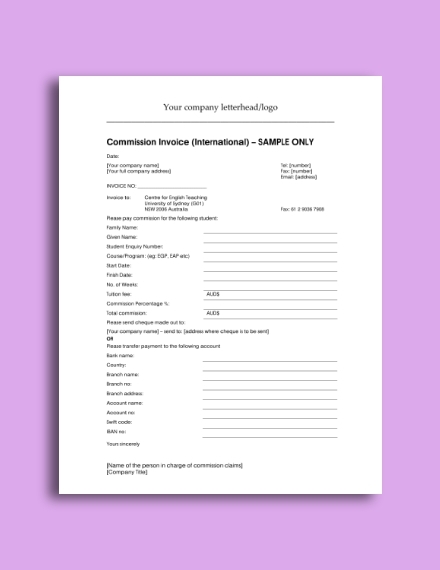 Commercial Business Invoice: Commercial business invoice is specific to foreign trade transaction, that is, when goods are being shipped from one country to another. It also acts as a proof of transaction for custom authorities. 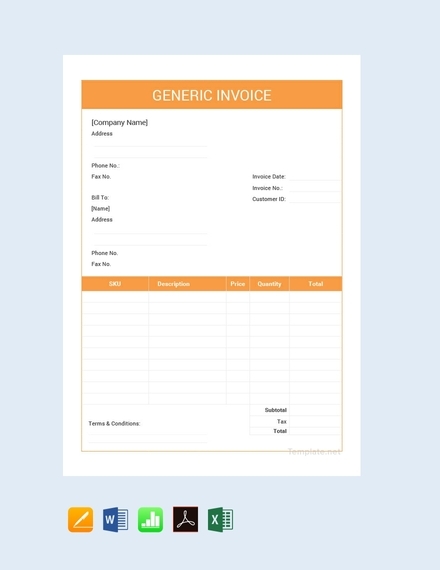 Utility Business Invoice: This invoice is meant for utilities availed of by the customer such as water, electricity, and internet. A utility business invoice shows the amount payable by the customer to the service provider for the services rendered for a particular period. Milestone-Based Business Invoice: This type of invoice is issued based on the milestone achieved on a certain project. This shows the percentage of completion for the work, and the billing is done according to the terms and conditions agreed upon by both parties before the start of the project. 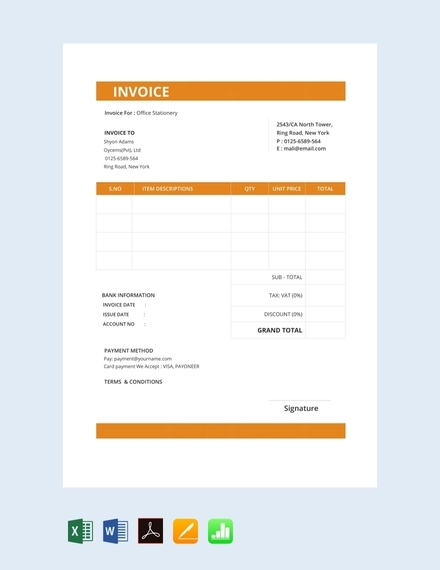 Normal Business Invoice: These invoices are used for different kinds of business transaction, hence a generic invoice. It contains the details of the products or services sold to the customer as well as the terms and conditions of the transactions. Moreover, just like any other invoice, the invoice number, issuance date, and due date are also essential. Time Billing Business Invoice: This type of invoice is commonly used by service providers who are paid at an hourly or daily rate. 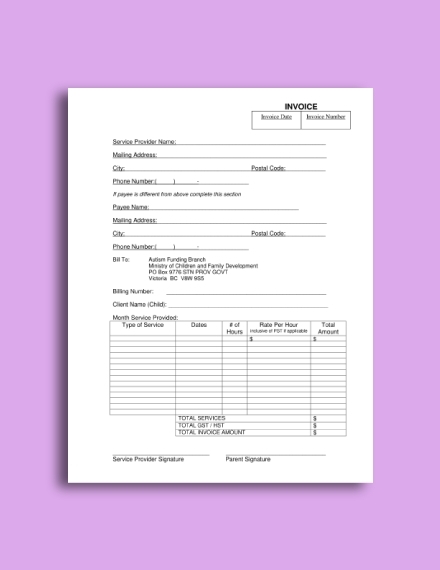 This invoice carries the hourly rate, the nature of the service provided, and the hours worked by the service provider. Pending Business Invoice: This invoice shows the amount that is yet to be paid by the client. Usually, only a portion of the payment has been made by the customer, so pending invoices are issued by the seller in order to remind or request payment from the customer for a payment due. Credit Business Invoice: This type of invoice is issued for the adjustment of pricing in case of last-minute discounts as well as when certain goods are returned by the customer. Debit Business Invoice: While a credit business invoice is issued by the seller, the buyer counterpart is the debit business invoice. It is issued by the customer while returning certain goods to the seller. What is the purpose of a business invoice? 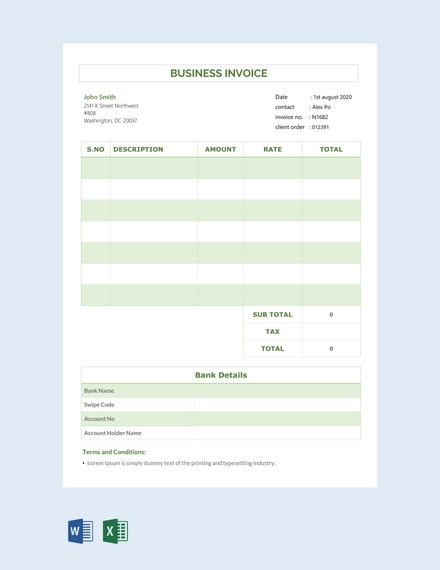 A business invoice serves as a request or reminder for the payment of the goods or services provided to the customer. It is also important for tracking purposes as well as for record keeping, accounting, and auditing of the sales transaction. What are the preparations needed before you start invoicing? Consider the use of tools, programs, or software that could help you create, manage, and record your invoice. Moreover, you need to know the customer information as stated above such as the name of the client, address, and contact details. You must also come to an agreement with the customer regarding the method of payment and the payment terms. What information in your invoice do customers need? On the part of the customer or buyer, they need an invoice in order to certain important information regarding their transaction with the seller. These information include the billing terms, late payment charges, purchase order number, and your contact information. Hence, ensure that you have all these information on your invoice.